The PNCC Seminary is named the Savonarola Theological Seminary. The organizer and first Prime Bishop of the PNCC, Francis Hodur, held great admiration for Savonarola’s work in attempting to reform the Roman Catholic Church. At 7:30pm on Sunday, October 2, 1898 then Father Hodur lectured on the life of Savonarola, recalling that Savonarola was burned at the stake in 1498. Father Hodur proceeded to burn the writ of excommunication he had received from the Roman Church, and had the ashes of the document tossed into a stream below the Cathedral parish in Scranton. The Savonarola Theological Seminary is an institution of higher learning founded and sponsored by the PNCC. It offers men an opportunity to achieve a higher education in the liberal arts, philosophy, Biblical studies, theology, and guidance in their vocation to become priests of the PNCC in service to God and His people. Girolamo Savonarola (1452–1498) was an Italian Dominican friar and preacher active in Renaissance Florence, and known for his prophecies of civic glory and calls for Christian renewal. He denounced clerical corruption, despotic rule and the exploitation of the poor. He prophesied the coming of a biblical flood and a new Cyrus from the north who would reform the Church. This seemed confirmed when Charles VIII of France invaded Italy and threatened Florence. While Savonarola intervened with the king, the Florentines expelled the ruling Medici and, at the friar’s urging, established a popular republic. Declaring that Florence would be the New Jerusalem, the world center of Christianity and “richer, more powerful, more glorious than ever”,he instituted a puritanical campaign, enlisting the active help of Florentine youth. In 1495 when Florence refused to join Pope Alexander VI’s Holy League against the French, Savonarola was summoned to Rome. He disobeyed and further defied the pope by preaching under a ban, highlighting his campaign for reform with processions, bonfires of the vanities, and pious theatricals. In retaliation, the Pope excommunicated him and threatened to place the city under an interdict. A trial by fire proposed by a rival Florentine preacher to test Savonarola’s divine mandate was a fiasco and popular opinion turned against him. Savonarola and two lieutenants were imprisoned. 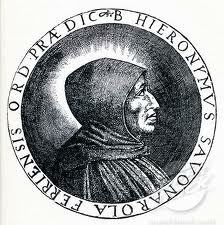 Under torture, Savonarola confessed that he had invented his visions and prophecies. 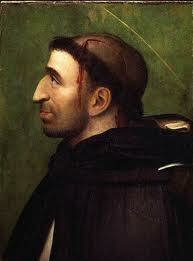 On May 23, 1498, the three friars were condemned, hanged and burned in the main square of Florence. Savonarola’s devotees, the Piagnoni, kept his cause of republican freedom and religious reform alive well into the next century, although the Medici – restored to power with the help of the papacy – eventually broke the movement.